I fell in love with blood oranges on my visit to Italy. They were everywhere and so fresh! I find them to be less acidic than regular oranges and the color is beautiful! 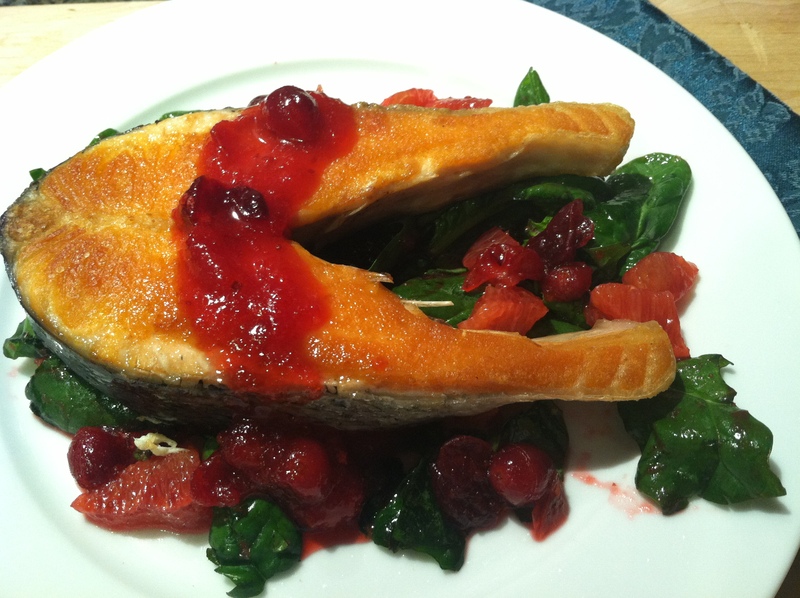 I decided to mix the flavors of fresh cranberry sauce with the blood orange and incorporate them with a spinach salad. The flavors are wonderful together and pair very nicely with the salmon steak. Just a little bit of olive oil, salt and pepper and you have a delicious meal that is packed with vitamin C, fiber, Omega-3, and iron. Prepare the cranberry sauce as according to the package. usually 1 cup water to 1 cup sugar. Heat to dissolve and boil for 5 minutes. Add the fresh cranberries and simmer for 10 minutes, stirring occasionally. Remove from heat. Heat the olive oil on a non stick skillet. Season the salmon with salt and pepper. Place on the hot oil and cook for 4 minutes over a medium low heat. Carefully turn salmon onto other side and cook an additional 4 minutes. In a bowl, mix the spinach with the blood orange and 2 tablespoons of the cranberry sauce. Place the salad on a plate and top off with the salmon and some additional cranberry sauce. Enjoy!